If you have any interest in the new age genre, you’ve no doubt already identified some of the most compelling new age piano music. For the most part, instrumental new age music is based on piano or keyboard melodies (although classical guitar is often another popular choice among these musicians). However, if you are new to this genre, you can find many wonderful new age music stations on the internet where you’ll have the opportunity to hear some of the best new age songwriters and musicians for free. Once you’ve identified some favorites, you can invest in their recordings for your personal collection. The popular website RealMusic.com has a free radio station playing 24/7; and also sells new age music cds and new age music mp3 files that can be instantly downloaded and listened to. This is a wonderful way to introduce yourself to the wide range of new age music styles artists. One new age music superstar, Canadian born Marcomé records and sells her music from her own website where you can also listen to samples from her albums. 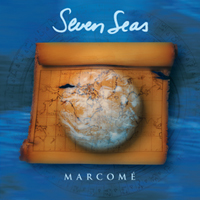 Marcome’s music incorporates piano, guitar, and her ethereal voice in music that is distinctly influenced by music from around the world. New Age music may also be classified as ‘easy listening’, ‘smooth jazz’, or ‘world music’, depending on who is selling or playing it. Much of it is instrumental and has soothing vocals where the performer’s voice is actually used more as an instrument than to convey lyrics. These haunting melodies do more than just promote relaxation. They are also used for enhancing meditation, accompanying yoga, and stimulating healing. All music has a vibrational frequency which is made up of both the sounds of the instruments and voices that make it, as well as the intent and inspiration from which is was created. Most new age musicians are spiritual people who seek to nourish positive change and an evolution of human spirit for the entire planet. These individuals bring joy, love, and beauty to their art and it can be heard and felt by the listener. This is why so many people choose new age piano music to accompany them in their spiritual pursuits. New age piano music (and all other forms of new age music) is enjoying a great deal of popularity as human society heads into the 21st century. Despite many of the desperate condition around the world, there has never been a time in history when the opportunities for spiritual change were so ripe. A silent network of people around the globe is opening themselves to the new age which will usher in a period of light, peace, and truth seeking unparalleled in human history. New age music is for everyone-old and young, rich and poor, educated or not. It has a quality that transcends the exterior experiences that separate us, and gives us a common ground for connecting with one another: the human spirit. The more we focus on commonality of the human spirit, the sooner our earth will see the realization of the coming new age. I think it is an error to place too much importance on classifying music, you may as well try and classify raindrops. To me music that is easily classified can lack certain creativity, also classification can build what I could loosely term a genre prison, where artists who find success in one particular genre can be constrained to that genre by commercial pressures. I value music that displays polymorphism, that can contribute to the evolution of more than one genre. I find this to be evident in Marcome compositions, mainly through her unique vocal style. Her song Memoria, to my ear draws strongly on the tradition of Eno, in particular Music for Airports, aurally I hear the piece in the Ambient genre but the power of the philosophical message breaks the piece out of ambience and firmly into Adult Contemporary and New Age. There is a similar phenomenon to be observed in her beautiful song Dawns Spirit, which I have included in two of my internet radio streams. The song enhances new age music but also I have included it in a slow jazz station, it works superbly in the context of jazz as a result of the intricacy and tonal diversity of her improvised vocal line. There is a methodology of philosophical and social research based on a belief in the unity of all things that is to read the literature, to conserve and emphasize knowledge that unites domains, a kind of monadic epistemology. Is there some kind of underlying unity in music? 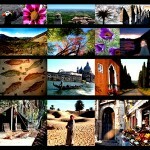 at a first reflection one recoils with horror at the thought at the loss of diversity. My favorite composer Arvo Part has a saying “the soul yearns endlessly to sing”, here he has sublimely pointed to a possible definition for this unity, music as the voice of the soul. What is the source of the human creativity and desire to experience music? This is why I so highly value Marcomes music, in her singing I hear a soul who yearns to sing. A soul deeply in contact with this mystical creative source. By transcending genre she contributes to the evolution of many genres not just New Age music. 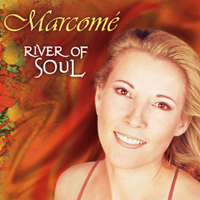 My most loved Marcome song is Nostrie Tiempo form her album River of Soul, I would never try to classify this piece, just as I have never been comfortable with a bird living its life in a cage, for me this song must remain free and transcends category, this mystical song sets my soul free with its beauty and power. To my ear this song extends three genres, Ambient, New Age and Film music. 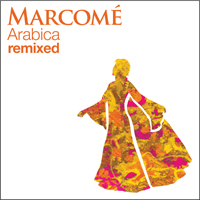 Great music Marcomé and very relaxing to listen to while working or as a switch off to meditate and get in touch with one’s higher self.